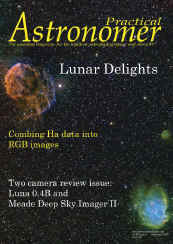 Puyblished as the cover and 2-page centerfold of Practical Astronomer from the U.K. Click on image for link to the issue. Astrodon H-a, OIII, SII 50 dia. filters. U16M unbinned at -25C. 20 min exposures. The image was scaled from 4098x4098 pixels to approx. 2500x2500 pixels, with only minor cropping of the edges. 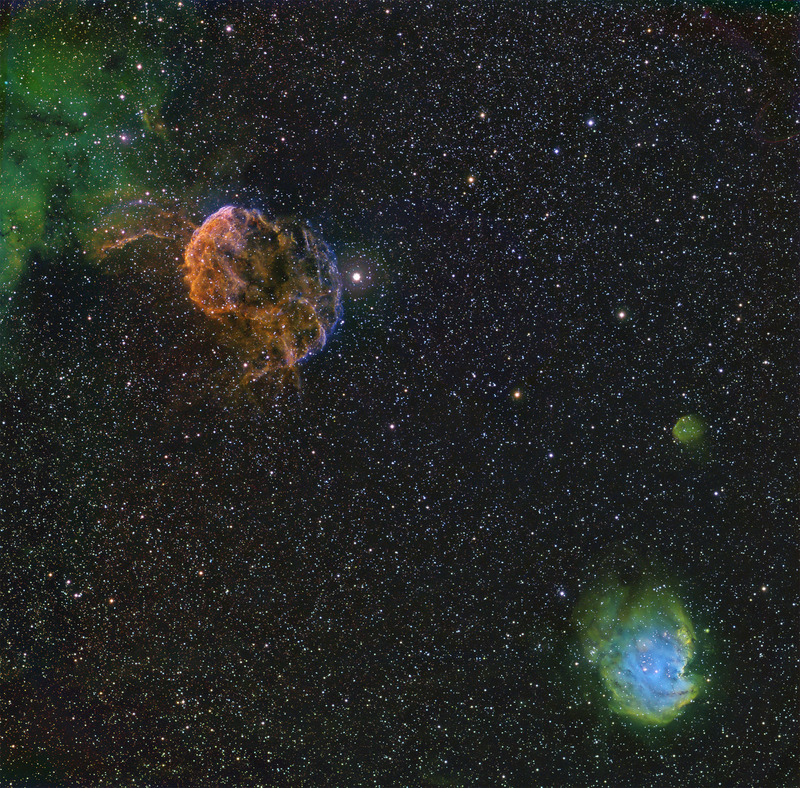 3x60s R,B,G were combined and blended into the tricolor narrowband image to enhance star colors. IC443 in GEM is considered to be a supernova remant of an explosion that occurred 30,000 years ago containing a pulsar, G189.6+3.3. Appearing in the upper left of the image, it gives the eerie feel of a cosmic jellyfish, and has thus been named the Jellyfish Nebula. It has a considerable SII signal. The bright emission nebula in the lower right is NGC2174 containing an open cluster, NGC2175. It has a strong OIII signal with some SII-rich regions. It gives the appearance of a monkey’s face. The smaller, faint circular object to the north of NGC2174 is Sh2-247, and is mostly H-a with some SII. The bright star near IC443 is Eta Geminorum (Propus). The field is approx. 4 x 4 degrees and north is up.